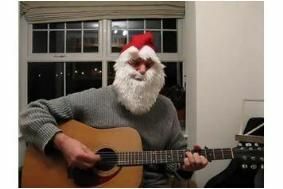 Vote for the winner in Audio-Technica's alternative Christmas song competition | What Hi-Fi? Launched in October, the purpose of the competition was to seek out "fun and vibrant" alternatives to traditional Christmas carols and songs. The nationwide competition was launched through the company's Facebook and Twitter channels, with entrants submitting video entries via YouTube. Acclaimed producer Steve Levine chaired the judging panel, helping to draw up the final shortlist of six. Now it's down to you, the voting public, to choose which track you think should win the top prize of £500-worth of Audio-Technica equipment. Harvey Roberts, senior marketing manager at Audio-Technica, says: "When we started the competition, we were looking for people to be as creative as possible and really push the boundaries of traditional Christmas music. I can safely say we haven't been disappointed with the standard or number of entries. In fact, we have ben really impressed with how British musicians have embraced our idea." The online competition was not restricted to any particular type of music or bands, so DJs or music producers from any genre had the opportunity to show off their skills. 1) Santa is a Mod: "I never knew Santa was a mod! An intereseting concept and highly original. Cool video too." 2) Come Back Ebenezer: "Great lyrics – the grumpy old man's Christmas – superb job." 3) Jingle Bells: "I can see a lot of work has gone into the editing of this one!" 4) Astropets: "Banjos on a Christmas record! I'd never have thought they'd have worked so well." 5) 2010th Noel: "Dark and original video – very cinematic." 6) Ky and the Kassettes: "This is a great song. The only soul/R&B entry." To vote for your favourite video, click here. The winning entry will be announced on Thursday, December 23rd. The winner will get £500 of Audio-Technica equipment, and the five runners-up will each get £100 of kit.